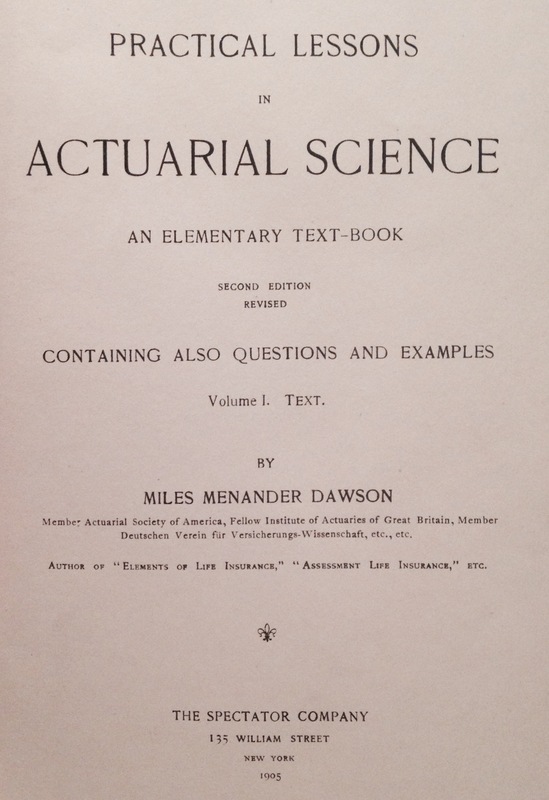 Find occasion to quote this actuarial authority in some official capacity — Practical Lessons in Actuarial Science: An Elementary Text-Book, by Miles Menander Dawson. Click on the image of this book’s title page, then enlarge that if need be, and you’ll find this second edition to have been published by The Spectator Company in 1905! As in, 39 years older than the Society of Actuaries. As in, the book is some 13 years older than our dear neighbor, who celebrates his 97th birthday next week. As in, if the book had been born in the year it was published, then it would now be 10 years older than the last age given in the mortality table given in the book! A colleague tells of a tax court case that cited a professional conference she attended, then pointed to indications that she had not objected to a position that had been presented by other attendees at the meeting. Apparently by her silence having the power of authority. That, during a discussion of whether training materials constitute legitimate basis for taking a position in the absence of any other authoritative reference. It not being completely insignificant to the discussion that the position being promoted is not right, or reasonable, or good or whatever we choose to use as our guide for judgment. Without going into detail that should be left to future public pronouncements, let’s just say that if the position being promoted by some promoters were to prevail, it would be a very short matter of time before even Congress would step in to make things right, even given how bad Congress’ record is on taking concrete action on things that really matter. KEEPER:      Stop! What is your name? GALAHAD:     Sir Galahad of Camelot. KEEPER:      What is your quest? GALAHAD:     I seek the Holy Grail. KEEPER:      What is your favorite color? GALAHAD:     Blue. No yel--  Auuuuuuuugh! One of these days a year or two from now, maybe I can come back and fill in some of the details on this one. Not today, not while I remain where I am. Even the hint of a whisper I give in this post is perhaps more than I should be saying out loud. So, I have me a new smart ID for work. Smart IDs. Smart phones. Smart cars. Smart bombs. Everything is going smart. Except me. I’ve always said I was never all that smart from the getgo. As I understand it, I tested barely above what they used to call “retarded” on IQ tests given early in youth, and I’ve always had difficulty thinking things through. All along, the only way I was ever able to keep up was learning to use those strange loops and extra dimensions I found inside my head. Now, since my shananigans, those voices have fallen quiet and I haven’t been able to get them back. Leaving me with an identity not all that smart. They tell you they don’t want you to smile when they photograph you for these smart IDs. Hard not to, given the irony of it all. Oh well, I only expect to wear it another year anyway. Audience – Instead of speaking to actuaries, or even pension lawyers or other pension professionals, my audience was IRS agents who generally had zero knowledge of pensions or employee benefits. Topic – My basic topic was the difference between the accounting applicable to pensions under U.S. standards versus international standards. That topic would not have been odd at all while I was at Milliman – in fact, I wrote two separate pension accounting articles for the Enrolled Actuaries Report within my final 18 months there. But at the IRS, accounting issues have been as distant from my work as some distant galaxy light years away, so far off that I have felt completely comfortable keeping my spreadsheet “hobby” separate from official work. Geography – Do I get “travel comp” time for the commute up the Gulf Freeway? This speech was delivered at the IRS building in downtown Houston. At least I didn’t need to struggle with GovTrip paperwork! 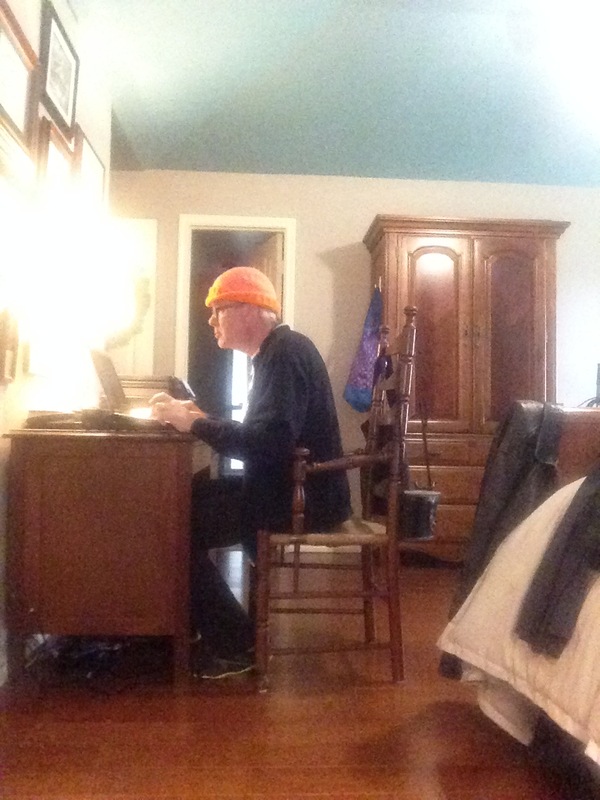 Prep Time – Rhonda phoned me about doing this speech less than 2 weeks ago. Although of course I’ve had enough background on the topic to feel comfortable with the material, the absence of focus on accounting issues during my IRS tenure did mean that I needed to dust off some rust and double-check for any updates during the past two years; so I did not finish my preparations sufficiently to actually prepare my slides until this morning! All in all, I think it went well. As usual for my presentations, I instantly knew there were some things I will be changing if and when I deliver this presentation again (which might actually happen, given emerging developments in pension accounting). Notably, I think the presentation would do well to center around a structure building a reconciliation between the two standards that would focus specifically on the six components of pension cost under the U.S. standard (including the different places in a financial statement that those items can land, since the profit statement won’t always be the target any longer). And perhaps some actual M-3 illustrations. Since the Schedule M-3 was the premise for the 2-day meeting of which my 30-minute presentation today was part. That corporate income tax return schedule giving rise to a concern I afterward expressed to my own manager: that I worried that many of our own pension actuaries might think an M-3 to be some type of rifle, thereby failing to be in any position to provide any support to our agents on any pension-related M-3 questions. My manager responded by saying that I was “it” – another sign that this is unlikely to be the last I see of this topic (and leaving me scratching my head as to why it took them until less than 2 weeks ago to let me know this was all coming up). I recognize it, I admit it, I confess it: Were it possible, I would love to let last week’s episode – our country’s top senior pension attorney unexpectedly folding, accepting the position I had established – would mark a very fitting end to a very full and satisfying career. That single event echoing and balancing out all of the singular events in my early work, and providing more than ample proof that I had not simply gone on coast a decade ago. But I need no further confirmation, no further additions to a resume I no longer need. And I am finding no further interest in my work after that moment last week. Not yet, anyway.